The ASEAN Emblem shall be the official emblem of ASEAN. The ASEAN Emblem represents a stable, peaceful, united and dynamic ASEAN. The colours of the Emblem — blue, red, white and yellow — represent the main colours of the state crests of all the ASEAN Member States. The blue represents peace and stability. Red depicts courage and dynamism, white shows purity and yellow symbolises prosperity. The circle represents the unity of ASEAN. 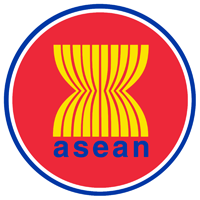 The ASEAN Emblem is the reserved copyright of ASEAN. The ASEAN Emblem shall be used in a manner that promotes ASEAN and its purposes and principles. It shall not be used for political purposes or for activities that harm the dignity of ASEAN. The ASEAN Emblem shall not be used for commercial purposes unless the entities concerned obtain official approval through the procedures stipulated in Article A.4. ASEAN Member States are encouraged to use the ASEAN Emblem in official functions relating to ASEAN. The ASEAN Emblem shall be placed to the right of the ASEAN Member States’ National Symbols, as seen by the viewer. Display at ASEAN official functions. Entities officially associated with ASEAN as in Annex 2 of the ASEAN Charter may use the ASEAN Emblem in their official correspondences and meetings. Other entities based in an ASEAN Member State shall submit their request for the use of the ASEAN Emblem to the ASEAN National Secretariat concerned. Other entities based inside the ASEAN region that also have regional/international characteristics and/or operations, shall submit their request for the use of the ASEAN Emblem to the Community Relations Division of the ASEAN Secretariat, who will subsequently refer their request to the Committee of Permanent Representatives to ASEAN for consideration and approval. Other entities based outside the ASEAN region shall submit their request for the use of the ASEAN Emblem to the Community Relations Division of the ASEAN Secretariat. prototype of the proposed use of the ASEAN Emblem. The ASEAN National Secretariats, the Committee of Permanent Representatives to ASEAN, and the ASEAN Secretariat shall consider all requests under their specific jurisdiction in accordance with paragraphs 13, 14 and 15, respectively. The approval granted shall be exclusive to the proposed activity. Such approval shall not be extended to third parties. Authorisation to use the ASEAN Emblem does not confer on those to whom it is granted any right of exclusive use, nor does it allow them to appropriate the Emblem or any similar trademark or logo, either by registration or any other means. The ASEAN Emblem shall be reproduced in accordance with the Specifications and Colours indicated in the Annex. Specifications in brackets are to be used when an arbitrary measurement of process colours is not possible. The font used for the word “ASEAN” in the Emblem is lower-case Helvetica in bold. The Emblem shall appear either in the specified colours or in a singular colour of black, white, gold or silver. It can be enlarged or shrunk in proportionate size as appropriate for its use and place of display. The Guidelines were adopted at the 6th Meeting of the ASEAN Coordinating Council (ACC), Ha Noi, 8 April 2010. Subsequent revisions (paragraphs 14 and 17) were agreed upon at the 14/2017 Meeting of the Committee of Permanent Representatives to ASEAN and noted at the 20th Meeting of the ACC, Manila, 12 November 2017.